New biomarkers for cancer immunotherapy have taken center stage at major oncology meetings recently, mostly notably the genomic biomarker tumor mutational burden (TMB). Multiple clinical trial results support TMB’s potential in identifying patients most likely to benefit from immunotherapy across a wide range of tumor types.1 For the first time, the U.S. Food and Drug Administration (FDA) is considering approval of an immunotherapy based on a cancer’s TMB. The biomarker appears poised to redefine the cancer immunotherapy landscape. However, this significant potential utility of TMB is also driving an urgency to make it available to every possible patient. Currently, TMB is primarily measured using a tissue biopsy, although not all patients will have sufficient tissue or will be able to safely undergo a biopsy. This means that not all patients will have the opportunity for TMB assessment through comprehensive genomic profiling. This is where liquid biopsies can help. Foundation Medicine is currently developing a test to measure TMB from blood samples. Blood TMB (bTMB) could provide a noninvasive option to identify patients most likely to respond to immunotherapy. However, because it is based on detecting fragments of DNA shed by tumor cells, called circulating tumor DNA (ctDNA), a blood-based TMB test presents a major detection challenge. Additionally, the magnitude of these challenges varies with cancer type and measuring TMB across all malignancies requires a highly sensitive and selective blood-based test with broad genomic coverage. Foundation Medicine’s novel, investigational bTMB assay has already demonstrated clinical validity, and may be able to address these challenges. We recently published data in Nature Medicine showing that our bTMB assay could help predict response to the anti-PD-L1 immunotherapy atezolizumab in patients with previously treated non-small cell lung cancer (NSCLC).3 The results also show that bTMB may be an independent predictor of clinical benefit, regardless of PD-L1 biomarker expression as assessed by immunohistochemistry for NSCLC patients who also had an available tissue biopsy. This retrospective analysis used data from the Roche/Genentech Phase II POPLAR and Phase III OAK clinical trials to identify bTMB thresholds and predict responders. A number of bTMB thresholds that correlated with clinically meaningful outcomes were identified using the POPLAR trial, then confirmed using samples from the Phase III OAK study. Within the OAK study, patients with bTMB scores exceeding 16 total mutations, or 14 mut/Mb, obtained a significant progression-free survival benefit from atezolizumab versus docetaxel (hazard ratio=0.65 [95% CI: 0.47, 0.92]; p=0.013). Additionally, the PFS benefit observed for bTMB high patients was specific to the immunotherapy arm, indicating the predictive nature of bTMB for immunotherapy benefit (interaction P=0.036) in this patient population. An expanded version of our liquid biopsy assay was also granted Breakthrough Device designation, and if approved, could be the first FDA-approved liquid biopsy assay to incorporate multiple companion diagnostics (CDx) and multiple biomarkers, including bTMB, to inform the use of both targeted oncology therapies and immunotherapies. 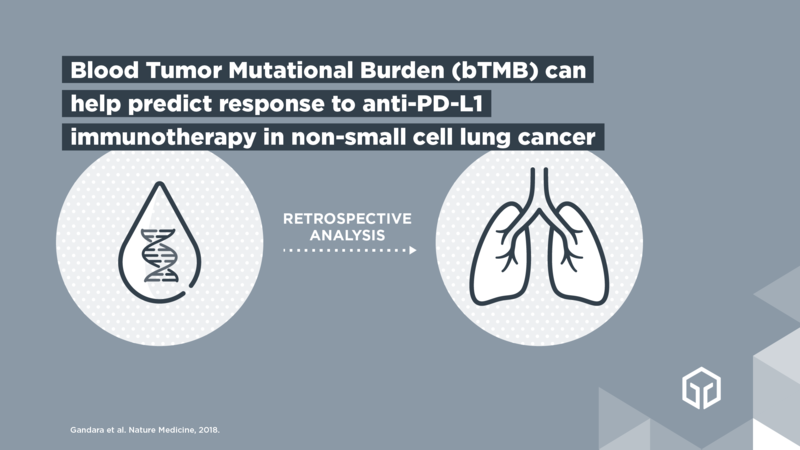 Collectively, these results demonstrate the potential of bTMB to expand the promise of personalized cancer immunotherapy to even more patients, and represent a major advance for the field of liquid biopsy.